One family’s journey from Mississippi to Chicago in 1936, as recalled by the now-grown daughter, interweaves the history of the Great Migration and African-American blues heritage. Cassie’s narrative begins as the family loads the car with all they own. Uncle Vernon’s up front with Daddy and Mama, and Cassie and two brothers ride in back, Daddy’s acoustic-guitar case across their laps. The family settles on Chicago’s South Side; the men work in the stockyards and play the blues every chance they get. Cassie’s narration seesaws between family scenes and insertions that feel contrived: a definition of the blues, particular blues lyrics, and name-dropped musicians. Oddest is a double-page spread that introduces musician Robert Johnson’s legendary devil’s bargain at a crossroads—without context. “Sometimes…I would fall asleep with the sound of the music in my ears, dreaming about Robert Johnson waiting at the crossroads for the devil to come.” The song is quoted above a sleeping Cassie. Opposite, a horned devil looms huge above Johnson in a red sky. Children not frightened by the image will surely be bewildered. The digital paintings resemble woodcuts. 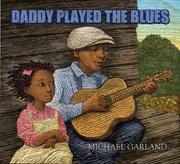 Garland’s signature use of squat, foreshortened figures effectively trivializes the adults, especially when contrasted with depictions of famous blues players, seemingly distilled from photos. In a lengthy author’s note, Garland provides historical background but conflates personal reminiscences with the musical history and celebrates the white rockers who appropriated the blues.